In an interview to CNN’s Freed Zakaria ahead of his US visit, Prime Minister Modi said that Indian Muslims would live and die for India and would not want to do anything bad for India. (Express News Service, 2014). PM Modi while addressing a gathering at the Nazerbayev University in Astana, the capital of Kazakastan on 8th July 2015, underlined the common Islamic heritage of both Indian and Central Asia which, according to him, would always reject the forces of extremism. According to the Indian PM, the Islamic heritage of both India and Central Asia, founded on the principle of love and devotion, was defined by the highest ideals of Islam, viz. knowledge, piety, compassion and welfare. “The dargahs of Delhi resonate with Sufi music that draws people from all faiths”, he said (PTI, 2015a), (PTI, 2015). The PM made similar statement earlier in Nay Pyi Taw delinking religion and terror (Sasi, 2014). Minister of Home Affairs Rajnath Singh too claimed that Indian Muslims were patriots and that Islamic State (IS) had failed to attract them (Bohra, 2015). However, in the year 2001, Narendrea Modi had claimed, “All Muslims are not terrorists, but all terrorists are Muslims” (Varadarajan, 2002). Later the Chief Minister of Gujarat, Narendra Modi used this statement extensively in his subsequent election campaigns. Following the 2002 massacre of Muslims and sexual assaults on Muslim women in many districts of Gujarat, there was anti-Muslim and anti-Islamic frenzy being whipped up by Gujarati Media. Modi did nothing to assuage this frenzy. His sadbhavana fasts came years later, and even then there were questions about his sincerity. Modi seemed to provide justification to the rioters committing mayhem on streets – rioting, according to him, was a reaction to the action of burning S-6 compartment of Sabarmati Express which he had then concluded without police investigation to be a conspiracy of Muslims. Later the Gujarat police did prove the conspiracy before the trial court but the verdict is under appeal. The massacre of Muslims in Gujarat was followed a gaurav yatra undertaken by Modi invoking “Gujarati pride”, which he claimed was hurt by the secularists who stigmatized all Gujaratis for the 2002 carnage. He would typically ask the people he was addressing – “Are you all murderers?” The next State Assembly elections after the riots were fought against not the opposition Congress Party, but “the Mian Musharraf” mentality of Muslims. Mian is a derogatory term used for Muslims and Musharraf was the then President of Pakistan. The term intended to signify that Muslims were loyal to Pakistan and both needed to be shown their place by the voters. While Modi was the Chief Minister of the state, Gujarat Police gunned down several Muslims alleging them to be terrorists belonging to outfits across the border. Murder of Sohrabuddin and Ishrat Jehan was later investigated and the then Home Minister of Gujarat – Amit Shah and several police officers were accused of the offence. Prime Minister Modi is not offering any explanation as to which of his numerous assessments of Indian Muslims really represents his honest opinion? Or have his opinions changed? What new information he received which led to the change? Minister of Home Affairs Rajnath Singh too had claimed in his address to the Directors-General of Police, Inspectors-General of Police and heads of Central Police Organisations in November 2014 that IS was trying to get a foothold in the Indian sub-continent, while Al-Qaeda had formed a branch for the Indian sub-continent keeping in view the Muslim population of Gujarat, Assam, Bihar, Jammu and Kashmir and Bangladesh, and convert Indian sub-continent into Islamic State. Such a threat could not be taken lightly, though he hoped that Al-Qaeda was proved wrong (Talukdar, 2014). Irrespective of answers to the above questions, it is true that Indian Muslims have contributed negligible human resources to the global terror networks. 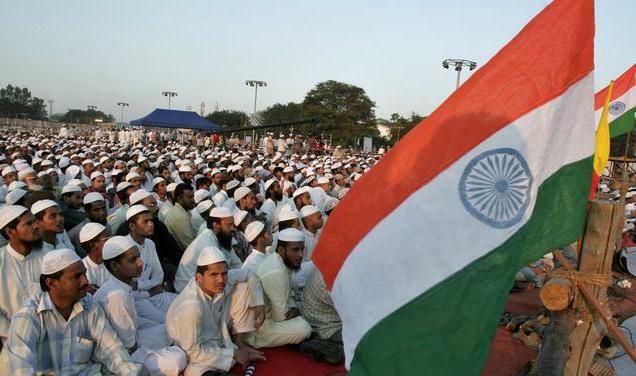 140 million Indian Muslims is second largest population in the world, next only to Indonesia. Indian security forces and intelligence agency have so far been able to trace 4 youth who emigrated to join the war led by self appointed Islamic Khalifa – Abu Bakr Baghdadi of IS. The four youth – Areeb Majeed, Shaheen Tanki, Fahad Sheikh and Aman Tandel – were from Kalyan. Honey trap and ideology misusing Islam were deployed to lure the youth. Areeb Majeed returned disappointed from the IS led war as the “woman” who was corresponding with him abruptly discontinued all the social media accounts that were being deployed to communicate with him. The well qualified youth were asked to do menial non-combatant jobs. What put off Areeb was the treatment of women by the IS combatants (Tiwary, 2014). Besides these 4 youth, there were reports of a 24 year old executive in an Indian multinational company and resident of Bengaluru – Mehdi Masroor Biswas – who was accused of broadcasting IS’s terror mission and luring recruits to fight in the Baghdadi led army through his twitter handle @ShamiWitness. Mehdi was tracked after he gave his interview to Channel 4. The intelligence agencies, having their own interests and training to suspect educated Muslim youth as terrorists on flimsy grounds, have claimed 20 youths from India are in Iraq, Syria and Afghanistan fighting with the Islamic insurgents or at least providing assistance to them (Times News Network, 2015). Areeb claimed there were a few recruiters of IS in the country. Yet why are they failing so utterly? If such an utterly pitiable number of Muslim youth have been recruited for IS, what must be the reasons? Compare this with more than 20,000 foreigners from 90 countries, recruited to fight for the IS. 3,400 fighters were drawn from Western states, according to Nicholas Rasmussen, director of the National Counterterrorism Center – 180 Americans according to National Intelligence Director James Clapper; 130 Canadians; 1,200 French fighters; 600 UK nationals – 5 recruited every week; 50 Australians and 600 Germans (Berlinger, 2015), (Ward, 2015). Bangladesh too has only few recruits – Hafizur Rahman, Asif Adnan, 26, Fazle Elahi Tanzil, 24, and three others were arrested by Bangladesh security agencies for being recruited to fight IS war Samiun Rahman alias Ibne Hamdan – a British citizen of Bangladeshi origin was recruiting Bangladeshis from the northern city of Sylhet for IS war. He was targeting Muslims from Bangladesh as well as Myanmar (Hall, 2014). Police arrested Aminul Islam, IT head of a Coca Cola unit and Sakib Bin Kamal, a school teacher for recruiting 25 Bangladeshi youth for IS (Variyar, 2015). Why Indians haven’t joined global terror networks? 1) The religious leadership of Indian Muslims is largely drawn from the seminary Darul Uloom Deoband, and other seminaries too e.g., Nadwatul Ulama, Lucknow. The Darul Uloom Deoband controls thousands of small seminaries and chain of madrasas and maktabas. Ulama of Deoband, organized into Jamiat Ulema-i-Hind, have issued fatwa during a meeting attended by thousands of clerics and students on the Ramlila Grounds in Delhi against terrorism. They vowed to wipe out terrorism. According to the rector Habibur Rehman “Islam rejects all kinds of unjust violence, breach of peace, bloodshed, murder and plunder and does not allow it in any form”. Jamiat held a series of conferences and meetings with madrassas in Lucknow, Ahmedabad, Hyderabad, Kanpur, Surat, Varanasi and Kolkata to carry forward the anti-terror movement (Majumdar, 2008), (TNN, 2008). The Jamiat Ulema-i-Hind booked entire train and scores of their members and supporters travelled giving message of peace and opposing terrorism. However, Indian clerics are not the only ones to issue fatwa against terrorism. Such fatwas have been issued by other clerics as well, e.g. by Maulana Tahirul Quadri, a Pakistani cleric of Minhajul Quran now based in Canada. Religious leadership of Muslims in US and other countries also have issued such fatwas. 2) By and large Islam spread its influence in India by peaceful preaching. The first encounter with Islam was through Arab traders on the coast of Kerala in the 7th Century. As a result, Muslims retain their local traditions and culture and share the common heritage with non-Muslims. To give just a few instances, Muslims in Lakshadweep follow matrilineal traditions (Dube, 1994). Onam is as important a festival for Muslims as for non-Muslims in Kerala. Amir Khusro’s compositions on Holy, Maulana Hasrat Mohani’s regular visits to Mathura and love of Lord Krishna, Ras Khan’s compositions on Krishna, Bismillah Khan’s shehnai dedicated to Lord Shiva and Dara Shikho’s translations of Upanishads in Persian are just a few of many diverse instances of shared cultural traditions before Britishers encouraged communal divisions. Islamic influence in India largely grew on account of inclusive sufi traditions which served, fed and attracted the most marginalized and excluded sections of the society. Love was the basic religion the sufi (and bhakti) saints knew. The sufi doctrine is based on wahadatul wujud – unity of being – all beings are one and creation of God. Sufis also believed in suh-i-kul – total peace – embracing everyone. Peace within oneself and with external environment. Sulhi-i-kul is to be achieved by denying oneself all unnecessary selfish desires, fears (accept that of Allah), needs (accept basic ones needed to keep one’s body and soul together), urges, greeds, etc. Nizamuddin Auliya would sing bhajans daily morning in praise of Lord Rama and Krishna. Aartis by Hindu women are part of traditions during the tazia procession in many towns and villages. Given these cultural roots and cultural consciousness, it is difficult, if not impossible, to convince Indian Muslim mind with ideology of jihad. Sufi ethos is ingrained in the Muslim consciousness. A common Muslim finds little common in culture of Arabs and Muslims of other countries. The wahabi-salafi Islamic traditions spend considerable resources and efforts to Arabize Muslims under the pretext of following ‘correct traditions’ in accordance with Islam. However, their success is limited. Limited to the extend Muslims are excluded and made to feel alien, experience discrimination and suffer communal violence. Volumes have been written on the composite and shared regional culture across religious following. The growth of Hindu nationalists and their discourse would sadly contribute to Muslims turning to Arabization if only in search of unity amidst diversity of cultural traditions and language within the community. The feeling of alienation is much higher among the Muslims in some of the western countries. Most of them are from Asian origin and feel less at home in western cultures. Asians prefer to stay in neighbourhoods dominated by their own communities. Cultural alienation among youth, growth of racist forces which target Islam informed by ‘clash of civilization’ theory and participation of western armies in war against Iraq and Afghanistan create more conducive environment for Islamist to recruit youth for their war. 3) Urge to take revenge has been one reason for the Muslim youth in India to undertake terrorist activities. The March 12, 1993 bombs, bomb attacks in Zaveri bazaar and several other places on 18th March 2003, the bomb blasts in Ghatkopar BEST bus on 28th July 2003, terror attack in several suburban trains on 11th July, 2006 in Mumbai are some instances where Muslim youth were involved. However, that was out of desire to take revenge for 1992-93 communal violence in Mumbai and 2002 carnage in Gujarat. Several accused convicted for the offences relating to 12th March 1993 bomb blasts said in their statements during the trial that they participated in the conspiracy as they saw their near and dear ones being killed during the 1992-93 riots in Mumbai. Justice Srikrishna (1998) in his report states links the communal riots and the bomb blasts with the following words: ‘One common link between the riots … and bomb blasts of 12th March 1993 appears to be that the former appear to have been a causative factor for the latter. … The serial bomb blasts were a reaction to the totality of events at Ayodhya and Bombay in December 1992 and January 1993.’ The resentment among large number of Muslim youth was exploited by the Pakistani agencies. However, democracy in India is working much better than in many other Muslim countries. Though justice is slow, with human rights crusaders like Teesta Setalvad and other organizations, it was possible to get justice for the victims of Gujarat riots. Some accused were convicted and are behind bars. Those accused of Ishrat Jahan and Sohrabuddin case are still facing trial. Extra judicial murders by security forces have come down drastically with all such murders being problematized by human rights organizations. Given the hope for justice, there is less desire for revenge and hence negligible success of the IS recruiters in India. The democratic space for the marginalized is shrinking in India. It is under attack from a section of Hindu nationalists who have been emboldened to stigmatize Muslims and other minorities with calls to take away their right to vote, instigating them by calling them to go to Pakistan, calling madrasas as den of terrorism. Shrinking of democratic space and victimization of human right activists like Teesta Setalvad is cause for worry. Will we able to ward off IS and keep Muslim youth from terrorism for long? The democratic forces within the community seem to be strong enough. However, all marginalized sections would have to come together to defend and deepen democracy in India. The averment “all Muslims are not terrorists but all terrorists are Muslims” was made by Narendra Modi during a TV debate programme “The Big Fight”, in which Siddharth Varadarajan too was a participant. Narendra Modi then was the National Secretary of the BJP. The programme was telecasted on Star News Channel on 14th Sept, 2001. Some news paper reports have also referred to him as Aarif.